The driver was vey helpful and without him we wouldn't even found the place. Everything went how they promised. Quite easy to book online. It's good that you now the Price in advance. My taxi was on time (Well 2min late :D). There's no good phone number available, if you have questions about your trip Or something. 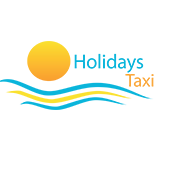 Thank you for choosing our company for yours transfers in Rhodes island. We very glad you were stay satisfied with our service. Kuljettaja tuli täsmällisesti pyydettynä ajankohtana, auto oli siisti ja kuski ei kaahannut.